July 4th Weekend is always a great time to take a moment and bid in an online auction. 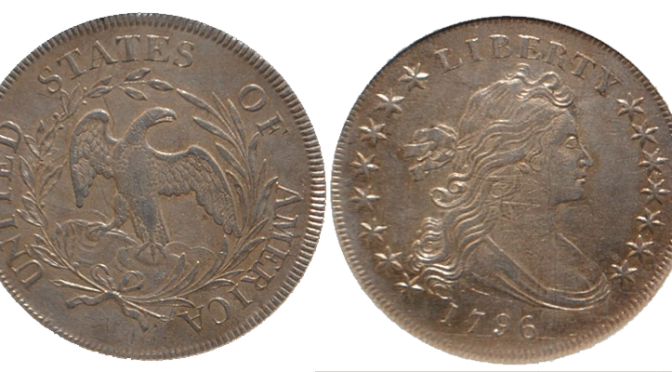 On Sunday, July 5th, James Peterson Company is offering almost 500 lots of Coins, Currency, and fine jewelry. This auction is available for absentee bidding, and live bidding starting at 11AM Pacific Time through iCollector.com. In this auction are hundreds of rare coins and currency, a selection of men’s and women’s jewelry, and a huge selection of gold coins to bid on. The very first lot in the online catalog is one of the best coins of the sale. At Lot 1, is a very rare offering. This is a 1796 Draped Bust Dollar graded NGC AU55. This is a once in a year offering from the company and currently the same coin graded at AU50 is selling for $16500, so there is no telling where this coin will go. The dollar is enclosed in a sealed holder, and is ready to be displayed as part of any collection. This will be in high demand so it is recommended to put in the maximum bids ahead of time to be sure to get in on the action. One of the most beautiful pieces of jewelry in this auction catalog is early in the sale at Lot 12A. This exceptional piece is a Ladies Platinum 1 CT European Diamond Ring. This ring has a large euro cut center diamond, full bezel set, and is weighing 1 CT. This is SI3 in clarity, J color, and has a fifty eight prong set with full round cut. This ring comes with an official appraisal certificate with all the details of the ring, and an average market replacement cost of $8750. This will be an incredible buy for the winning bidder and make a great gift.